New Delhi, Sep 12: Why are the BJP ruled states, led by Uttar Pradesh denying meat, fish, and poultry sellers from Muslim and Dalit communities licences to carry on their trade? That’s a question being asked, and there are no clear answers. The event, organised by SEHAR, a voluntary group, was attended by small meat-sellers, hotel and dairy owners from Noida, Loni (Ghaziabad) and the Mewat region of Rajasthan and Haryana. The meat-sellers and hotel and roadside eatery owners from Loni and Noida alleged “harassment” at the hands of the local police. “Around 60-70 shops in the slums of sectors 8,9 and 10 have been shut down by the local authorities. The police ask for no-objection certificates (NOCs), which are not being issued by the authority concerned,” said Ali Nabi, a meat- seller from Noida. Many sellers and others involved in the meat business said they were facing livelihood issues for months now due to restrictions and the police and local authorities demanding NOCs from them. “My family is in the meat trade for over three decades. But, I am sitting idle now due to the restrictions. I cannot send my kids to school as I have no money,” said Ismail from Noida. CPI(M) leader Subhashini Ali, who was also a jury member at the event, alleged that the curbs on the cattle trade in Uttar Pradesh had led to “extortion by corrupt policemen and so-called gau-rakshaks (cow vigilantes)”. 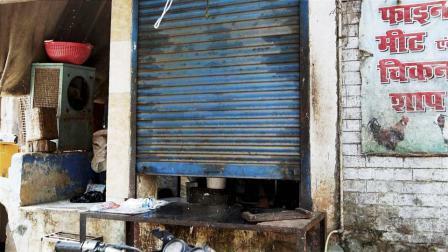 Ali Faiz, owner of a meat shop in Loni, complained that the municipality was not issuing NOCs, even when all the prescribed parameters were met. “Officials are demanding NOCs after the regime change in Uttar Pradesh. The parameters laid down by the Food department have been met by us, but the municipality is still not issuing the NOCs,” he said. The Centre had, on May 23, issued a notification, banning the sale and purchase of cattle from animal markets for the purpose of slaughter. In July, the ban was stayed for a period of three months by the Supreme Court. This stay ends in October.